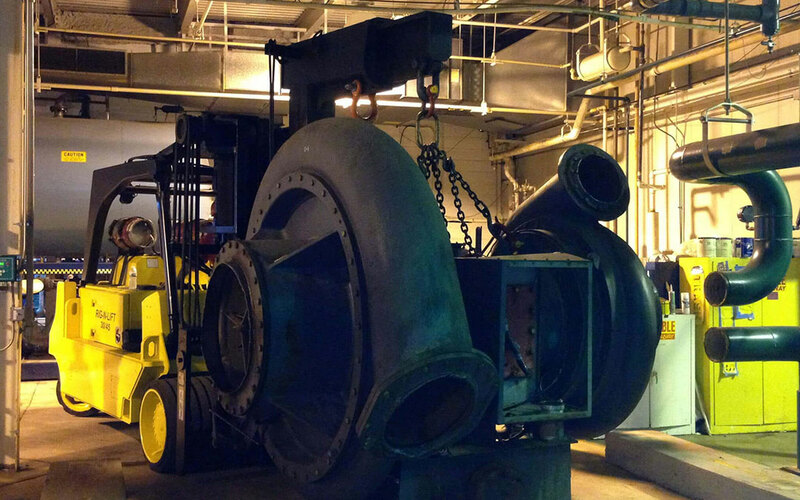 Heritage Industrial Services, Inc. (Heritage) was contracted to supply labor and equipment to perform the rigging and removal of (2) boilers and (3) chillers at the client’s commercial facility. Heritage was contracted by the client not only based on its competitive bid but on their safety record and ability to perform this work under a tight schedule in an active facility. The work was being performed as part of an overall renovation to the facility so it was critical that Heritage met or beat the schedule constraints. Prior to the start of work all electrical, steam, gas lines or other active supply lines were de-energized, isolated, capped and airgapped by the client. The client also drained all fluids from the units. This allowed Heritage to mobilize and instantly start rigging and dismantling work from day one. Heritage started by first disconnecting the process piping back to the nearest hanger and valve as needed. Concurrently, to facilitate access and removal of the units, Heritage removed the main roll-up door which was subsequently re-installed after project completion as if never removed at all. Once the preliminary preparation work of piping removals and access was completed, Heritage commenced the main phase of the project. The boilers were jacked and skated outside thru a tight door opening on plates to protect the asphalt driveway. The chillers also followed the same sequence to reach an outside staging area. This varied equipment weighing between 35-50,000lbs required close attention to detail and expertise that few can offer. All units were located on the first floor of the building with isolators and on standard housekeeping pads. This required numerous adjustments and reconfigurations to the rigging equipment. All equipment was subsequently loaded onto trucks for transport to a used equipment resale company. In order to remove these units, Heritage utilized 4 men, 5, 15, 30, and 45,000lb capacity rigging lifts, scissorlifts, roadplates, and proper tooling to complete equipment. Utilizing this crew and equipment, Heritage carefully rigged and removed this equipment without damaging any of the surrounding active equipment nor was there any damage to floors, walls or ceilings. In all, the project took 8 days to complete and beat the original projected schedule.